For travelers, Nepal is like the Switzerland of Asia. The Himalayan country is abundant in eternal snow, forests, and rivers, not to mention that on its doorstep is Mount Everest, the highest mountain in the world; one of seven summits that fall within Nepal of the total of fourteen worldwide that exceed 26,000 feet in height. For that reason, it attracts scores of trekking and climbing fans, as well as those who come to take inspiration from the awe-inspiring landscapes. People also travel to Nepal to experience its architecture and mysticism, given that Siddhartha – the future Buddha – was born here. As if that wasn't enough, on a tour package to Nepal you can visit the Terai jungle, a refuge of the last populations of rhinoceroses and tigers in this part of the Indian subcontinent. Although shaken by the losses caused by recent earthquakes, Nepal still has a great amount to offer. Passport with a minimum of six months or more validity. A visa is required. You can apply before arrival or you can obtain this on arrival in the country. 220 V. Electrical sockets are European style however an adapter may be useful. 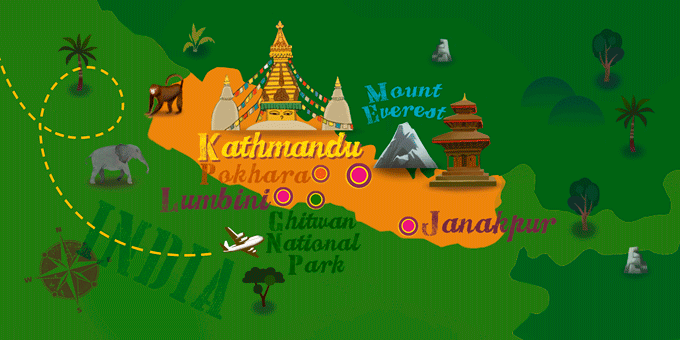 If Nepal has caught your attention, leave us your number so we can call you to discuss the voyage that awaits you.